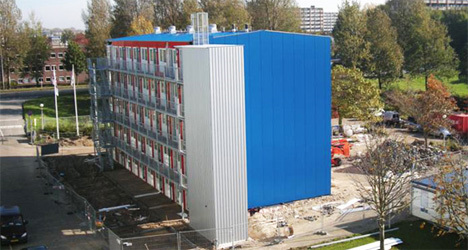 Tempohousing, the firm known for creating the amazing shipping container student dorms in the Netherlands, designed this temporary hotel to house foreign workers. Each shipping container arrived on-site fully furnished, and the exterior of the building was separately clad so that the shipping containers were concealed. The hotel is meant to be a temporary structure, and will be removed in 2013 to make way for luxury apartments.